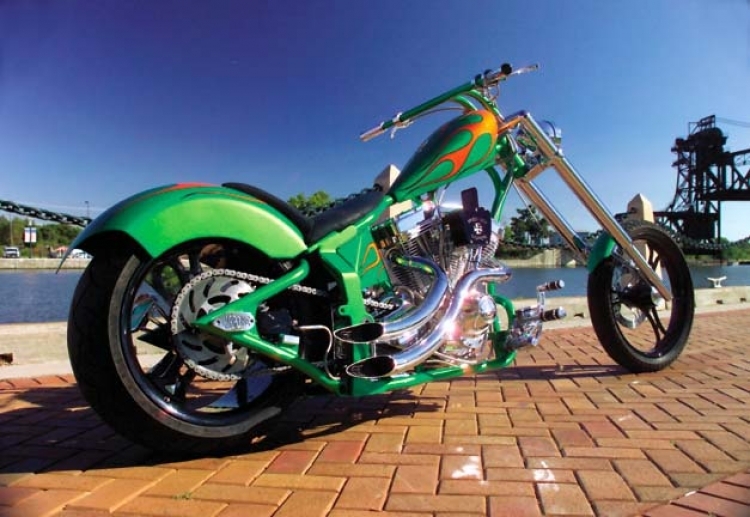 Joe Zolper of Prison City Choppers in Joliet, IL built this 280 rear tire chopper several months before the big Metzler was available across the USA. Obtaining the tire in a nonstandard but legal and effective manner, he manufactured one of his Kapone frames around it. With 40 degrees of rake in the frame, six more in the trees and six inches stretch upward and four out, this is yet another bike that won’t fit on standard length trailers. So it looks like you’ll just have to ride it to the rally. The 10” over American Suspension forks hold the last black billet rim from Speedpoint in Germany. The matching rear wheel is also out of production so an exact copy of this bike will be difficult. Powering the beast is a show polished 113” S & S engine breathing in through an S & S carb and exhaling through Martin Brothers exhausts. The proprietary PCC frame is accompanied by PCC handlebars, primary cover, shift linkage, and creative air cleaner. The air cleaner saves you the trouble of taking your hands off the handlebars to comment on other people’s bad driving habits. The lime green and tangelo House of Kolor paint was applied by Ricky Evans, a local custom painter and best man at Joe’s wedding. The pin striping was done by Jive, a legend in the midwest.